Arlmedia Drupal-Service: "Cumulus" in Drupal: are animated tag clouds useful or just troublemakers? "Cumulus" in Drupal: are animated tag clouds useful or just troublemakers? There is some debate about the pros and cons of static and animated tag clouds. Opponents see them as a waste of already scarce screen real estate for display of redundant information. Proponents of tag clouds see the tag clouds provide an X-ray image of a semantic depth: content behind static menus always has to be deducted in a logical - knowledge based - process within a hierarchical set of concepts. However tag clouds show an inductive way to the site-content. Descriptive keywords with the highest frequency appear prominently in the tag cloud and represent the pages content. Especially on a blog or a website with hundreds of sub-topics the general context can be displayed graphically. For many users, this is a valuable key to the content. Cognitive psychology studies on human data processing provide insight that users tend to react better (faster) to tangible terms than abstractions. The word"chicken" will be processed more quickly than the more abstract term"bird" or "vertebrate. Applied to an orthopedic site, the term "herbal medicine" or "natural medicine" will get more attention if presented directly, compared to be hidden behind the rather abstract term "therapy". Internet user in most cases are not academically trained researchers who would dive into hierachically organized knowledge systems as a matter of routine. 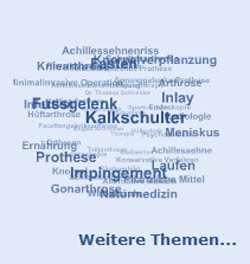 In our example - a medical website - you can easily find the term "natural remedies" in the three-dimensional structure of the Cumulus tag cloud, and dozens of similarly direct terms, without investing the even more scarce menue space. The animated tag cloud provides an intuitive usability. The clouds rotation and speed is easily controlled by mouse interaction. However graphic designers will still interpret this element as disruptive: It dissolves the static structure of the page to a certain extent. When defining the underlying taxonomy for the tag cloud be careful to find taxonomic terms short enough to be scanned at a glance: The users will not actually read the cloud but will process terms only as an array of visually scanned word images. 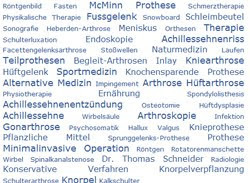 Terms like "arthritis" will be easily processed, however something like "chondrocyte transplantation" will not be easily interpreted as part of an animated tag cloud. Detailed instructions for installation of Cumulus on Drupal 6 can be found here.